In a world where climate change is becoming a more important and pressing issue every day, we are actively trying to diversify our energy portfolios by increasing power generation from renewable energy sources. In the United States, wind and solar energy as well as nuclear are the hot topics in discussions, but what if we are missing out on a resource with enormous energy potential? What if generating power from ocean waves and tides could help us reach our carbon dioxide emissions reduction goals? With oceans covering over 71% of the earth, harnessing the energy of waves has the potential reduce our reliance on fossil fuels and supply us with a predictable and renewable energy source for the future. The uneven heating of the Earth’s surface by the sun produces pockets of warm and cold air as well as high and low-pressure zones, causing circulation patterns to occur and creating wind. When the wind blows over the oceans, waves are produced. These waves have a tremendous amount of energy, and some of their energy can be harnessed for use by humans. The Electric Power Research Institute has estimated that the total wave energy potential along the outer continental shelf to be 2,640 TWh/yr, which is almost 65% of the electricity generated in the United States annually. Unfortunately, not all of that energy is recoverable, because there are competing uses for certain stretches of water (i.e shipping, commercial fishing, naval operations). EPRI estimated that 1,170 TWh/yr of wind energy potential is actually recoverable on the outer continental shelf, which is still enough to power over 25% of the United States. Wave energy resource potentials by region in the United States. Wave energy technology is far behind the technology for other renewable energy sources such as wind and solar, which is why it is a currently not viable for wide scale use. The harsh conditions that can be present in the ocean pose a significant challenge to scientists and engineers. There are currently multiple designs and systems being used to harness wave energy. There are floats or buoy systems that use the rising and falling of the ocean waves to drive hydraulic pumps which stroke a generator to produce electricity. The U.S navy has been testing out buoy systems off the coast of Hawaii since 2015 and has successfully connected the buoy to the grid via under water cables. 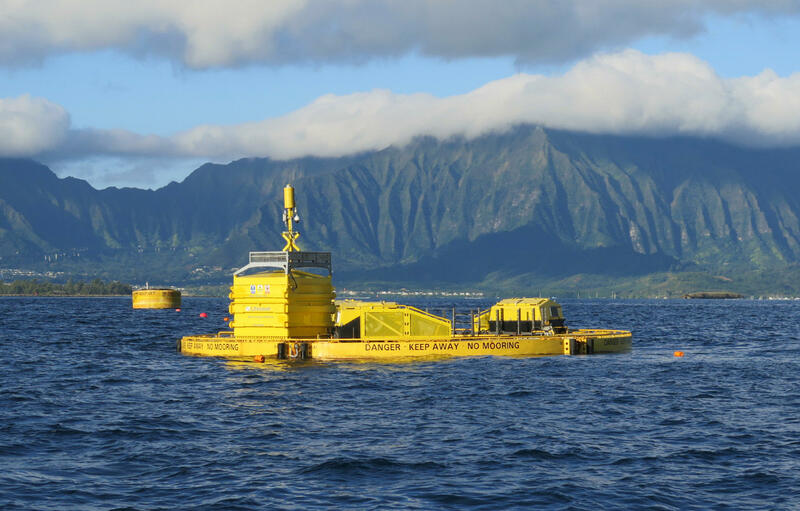 This was the first grid-connected test site for wave energy in the United States. There are also devices called terminators or oscillating water column devices that use the in-and-out motion of the waves moving through a column to force air through a turbine. The air in the column is compressed and heats up as the waves move in and out. Buoy system at the U.S Navy test site off the coast of Hawaii. It is about 50 feet wide. Multiple buoy system designs are being tested at this site. In 2008, the world’s first wave farm, called was tested and operated 3 miles off of the shore in Portugal. The farm was using devices called attenuators, which are long floating structures consisting of multiple sections connected by flexible joints. Energy is generated by the friction between the sections due to the action of the waves, and it can be harnessed by hydraulic pumps and transmitted via deep sea cables. The wave farm in Portugal was $11 million to construct, and was rated a maximum capacity of 2.25 MW. The floating structures were 120 meters each. 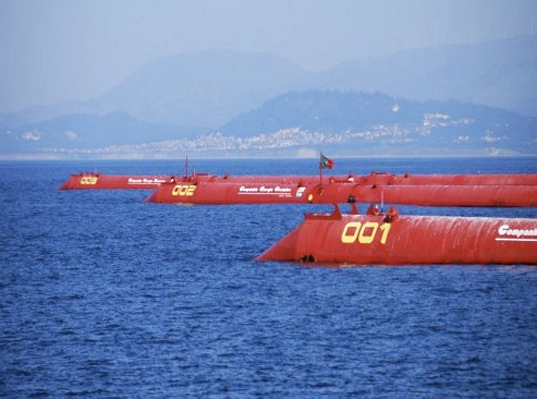 The Pelamis Wave Farm in Aguçadoura, Portugal came online in 2008. There are videos (although they aren’t very thrilling) on YouTube of the systems in action. Like all energy sources, there are advantages and disadvantages to wave energy. To start with the advantages, wave energy is renewable, because as long as the sun shines, wind and waves will be created. Second, it is a clean energy source, as it produces no greenhouse gas emissions. Wave energy also has an enormous energy potential, because our oceans are so vast and the water has a high energy density. This high energy density leads to less much smaller areas required, about 1/200 the area needed for a wind farm of equal energy potential. Finally, it is reliable and predictable. Wave activity can be predicted far in advance, and the waves will always be there. On the flip side, wave energy has its disadvantages as well. It has proven difficult to design system robust enough to handle the extreme conditions in the ocean and the 100 year wave. The equipment must be able to withstand external conditions such as the corrosiveness of the water, the colonization of structures by marine animals and algae, and the potential for unusually large waves. Marine life can get caught up in the systems, and if placed in wrong location, the systems can disrupt migration patterns. Another con is that wave energy systems are not very visually appealing, which can effect tourism in coastal communities. There is also a lot of uncertainty in the technology, which makes large scale investments risky. We don’t have a very good idea of how long these wave energy systems will last, how often they will require maintenance or how much maintenance will cost to mention a few issues. Finally, the current systems are very expensive, and until more significant technological improvements are made, they will probably continue to stay high. A few questions I have are: What are your thoughts or concerns about wave energy? Do you think it will become a viable source of energy in the future in the United States? Could this be a solution to powering remote coastal communities around the world? Although wave or tidal energy is years, maybe decades until it becomes economically viable to harness, it is a fresh and unexplored renewable worth indulging in. One idea that comes to mind for a potential future is the coupling of this renewable energy resource with a water desalination system. Desalinators consume a great amount of energy and require a steady source of salt water. The creation of a device that combines the energy production of a wave generator and a desalinator could be a perfect way to locally supply fresh water to coastal environments where they cannot as readily rely on aquifers or surface water. I think all research into alternative energies should be encouraged. To really evaluate wave energy, I think benchmarking it against offshore wind would be very telling. My gut would say that the cost of offshore wind, which is pricey already, would be far cheaper than what it would take to build and maintain these massive waves capturing structures, and probably more efficient too. Like you mentioned though, there are huge amounts of energy stored in these waves and hopefully some breakthrough will happen where it would be more economically viable to harvest it. The trick with financially feasible wave power is location. You need to find places where the difference between high and low tide is large enough within a short enough cross shore distance. In short, the land where the tide passes must be steep. It also needs to be relatively easily accessible in order to build facilities. These criteria rule out virtually the entire east coast of the US. Much of the steep coast line of the west coast is cliffs and unacceptable. This leaves a very small percentage of coastline where it is feasible. These are the real restrictions of wave power and why people do not put more effort into it. I think that you hit on most of the cons for the project. Most people aren’t going to want to see these off the coast of their city and it will probably be too expensive to put them far enough away to where they don’t see them. I feel like these would have similar issues to putting wind turbines off of the coast. Its just hard to do because nobody has done it yet. It is a good idea because of the renewable aspect of it, but as you mentioned, we don’t know how it is going to affect the marine life and what the maintenance of the generators are. In line with grackleman above, my mind immediately went to the potential of pairing devices like these with desalination plants, whether they can provide municipal power or not. That set-up would be picturesque for any designer or politician; energy from the ocean to claim water from the ocean. Thats a pretty sweet thought. As far as aesthetics, I wouldn’t worry about that too much. People are pretty good at making things look appealing when they need to. The conditions of the ocean are the major problems in my mind, particularly as severe storms and hurricanes pick up… I know most of the damage of a hurricane comes as the storm surges hit land, but if those waves lift the buoys too high, it could snap the cables under worst case; and if the grid is still live, that would put electricity in the water… not good. Overall, the idea excites me, and it is an iconic picture to the excitement that comes along with being an environmental engineer. There are so many freedoms for design because norms haven’t been settled yet. Our careers will provide no lack of possibilities for innovation and ideation. Again, excited to see what we’ll do! This is interesting because my understanding of wave energy generation was that the recoverable energy was so minuscule that it is not a feasible solution. It’s good to see that there are numerous projects evolving that can make wave energy a possibility. I’m a huge fan of renewable energy. I especially love seeing news designs and new ways to cleanly generate electricity. I love the idea of this technology, however I don’t see it taking off the way solar and wind has. One thing that I cannot get past is its lack of visual appeal. Oddly, I actually find wind and solar farms appealing. I’m not exactly sure why, but I just don’t see that when I look at these wave-powered machines. I do like how reliable and predictable the technology is though. There will always be waves. I would like to see this wave-powered technology succeed, but it is just so far behind solar and wind that I think the latter two technologies will outpace it. I have always thought that wave energy could be a contributor in the energy field. There is a such a vast expanse of ocean that can be used to harvest energy and, like you mentioned, don’t contribute to global emissions. This being said, I don’t believe that this the best source of energy. Right now it is very expensive to make these and the areas you can put them in are controversial. Yes you can put them close to shores as shown in the figure above but a lot of the area is used for boating, fishing, and other lifestyles that people depend on. Additionally, we don’t know a whole lot about our ocean and the marine life that lives there so it could be very damaging to the ecosystem. First off, thanks for writing about wave energy. I feel like it’s not widely discussed and often forgotten about or pushed aside, so this was a really fun read. Second, I think that the energy potential is definitely there, the real trick is going to be marketing wave energy as a worthwhile investment to potential investors and policymakers. It sounds like a pretty idealistic system until you look at design constraints you were talking about: durability, handling larger waves, weather, and such. Aesthetics shouldn’t be an issue considering that once technology becomes efficient and successful, how it looks is usually a conversation that follows. For the near future, if this technology gains some ground and word starts to get out about its effectiveness, then yeah it won’t be too long after that that wave energy can become a viable renewable energy option for the US and remote areas. It would just come down to whether it is worth it at that point given the technological advances that would have been made with other renewables and energy sources at that point. I do not think that wave energy will become a widespread form of technology unless the world becomes extremely desperate. As ocean territory is pretty much a common resource shared by the whole world, I think countries would run into difficulties politically. I also find it difficult to see us utilize the ocean when we know so little about it compared to our knowledge of the sky and land environments. Even with all we know about terrestrial environments and our impact on them, humans are still continuing such destructive practices on land. With the ocean so out of our direct line of vision and experience, I think expanding on wave technology would just bring greater harm to aquatic environments. The lack of wave energy has to be a technological advancement. I don’t know what the intricacies are of this technology, but I can see deployment being an issue for ocean activities. Shipping and fishing operations must not be thrilled at the prospect of having something else they have to navigate around. From the other perspective, could fishing operations damage the submerged parts of the power generators? Not entirely sure how construction out in the water would work for these things either. I can see the buoy one being built elsewhere and just dropped off a barge or something similar. Also, wonder what kind of backlash these things might get for just being in sight on the beach – which would be ridiculous with all of the development by buildings and hotels on the shoreline at a majority of beach destinations. Hopefully we will see wave energy being implemented in the near future! I think wave energy could play a large part in renewable resources in the future. I wonder what effects this could cause to ecosystems or the natural pattern of waves that is occurring on our oceans. Would harnessing energy from the waves cause a reaction or “dilution” of the waves themselves. Could this change alter currents and temperatures that ecosystems rely on yearly to remain constant? I think these are some questions that should be addressed or monitored to see if we would be creating more harm than good. I have always been interested in forms of renewable energy that come from the ocean (wave and tidal). I don’t know as much about wave energy as I do about tidal so it was good to read more about wave energy in this post. You mentioned competing for space in fishing areas, but these structures could potentially be helpful. If there are large underwater structures for anchoring the floating portion, they could form artificial reefs of sorts that could then attract fish.